When you run a business, one of the best things you can do is connect with other business owners. 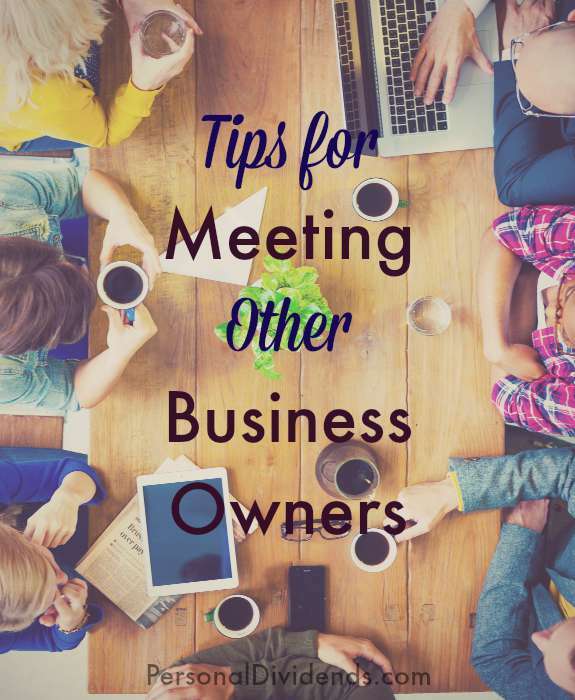 Meeting other business owners can allow you to find partners and mentors. At the very least, you can connect with people who might be able to provide you with ideas and join with you in a mastermind situation. Not only that, joining an association of business owners can also help you influence policies, strengthen your bargaining position and effect change in your community. If you want to be plugged into the business climate of your local area, the Chamber of Commerce is the organization to join. You will meet other business owners at meetings, and lend your voice to important issues in your town. Many Chambers of Commerce around the country organize meetings and events, and it is a good way to get to know local civic leaders as well as business leaders. There are many services clubs that can provide you with a chance to meet other volunteer-minded business leaders in your community. Organizations like Lions and Rotary give you the opportunity to give back while meeting other business owners. Many of these clubs also allow you the chance to get out in the community and be seen. Getting involved in a service club can also expose you to a different set of business owners than you might meet in a more traditional business setting like the Chamber of Commerce. If you graduated from college, one of the best things you can do is remain a part of the alumni network. Many graduates who go on to own their businesses belong to alumni associations and attend events. Stay in the loop, and remain active. You can also check to see if there is an alumni chapter in your local area. Return to your college for alumni days during major events like homecoming and founders celebrations so that you maintain those connections and grow your network. Social media can provide you with a great way to network with other business owners across the country. Thanks to the Internet, geography doesn’t limit your ability to connect with other business owners. You can get online and meet connections all over the world. While Facebook, Twitter and Pinterest can provide you with platforms for making business connections, LinkedIn is considered the network for “professionals.” LinkedIn groups can allow you to connect with other business owners in your field, or with business owners who have questions similar to yours. Participating in discussions can provide you with helpful hints and ideas, and give you the chance to establish yourself as a helpful member of the online business community. One way I meet other business owners is to attend conferences. This provides me with a way to make in-person connections with other business owners that are outside my local area. This broadens your ability to make deeper connections while at the same time reducing your reliance on geography. After meeting other business owners in person at a conference, you can then follow up online and remain in touch. Plus, many conferences also offer educational and insightful content that can help you improve your business. Be genuine: The advice you often hear is to be yourself. This is true whether you are connecting online or in person. You are more likely to make a good, lasting impression if you are genuine, rather than fake. While you don’t want to provide too much information too fast, you can still show who you are. Have an elevator pitch ready: Think about how to describe yourself and your business succinctly and effectively. This is your elevator pitch. Aim to keep it to no more than 20 to 30 seconds. Being able to quickly express what your business accomplishes is a good way to quickly let others see your value. Focus on relationships: While you do want to connect with people who can complement your business, don’t forget about the relationships. Focus on people and your relationships, and the rest will follow. Have business cards ready: Lately, I’ve been pretty bad at bringing business cards to events. In spite of our increasingly electronic world, business cards are still pretty standard. There are electronic business cards available, and Evernote has a neat feature that allows you to connect business cards to LinkedIn profiles, which can be helpful. You should have some way of collecting information about those you meet, and sharing your information in return. Meeting other business owners is a great way to grow your business and improve your overall success. Plus, it can also result in lifelong relationships that are personally satisfying.